The on-stage pitch has become a staple of documentary film forums, like IDFA and CPH:DOX, and pitch panels long ago snuck into events like IFP’s Screen Forward Conference (previously the Filmmaker Conference). But the on-stage pitching of web series is something relatively new at these more film-oriented events. 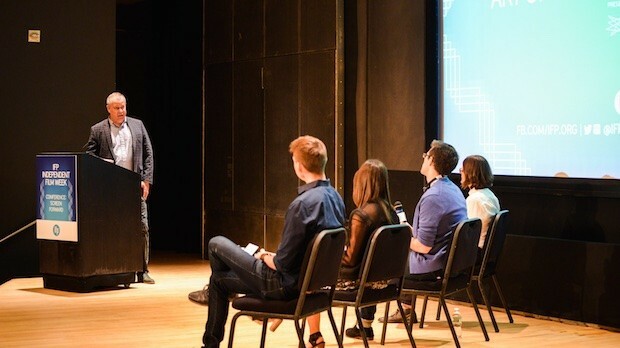 Befitting the IFP’s conference name change, three filmmakers storytellers took the stage Sunday at noon at the Bruno Walter Auditorium to impress a panel of web content professionals with their ideas of episodic tales to be streamed online. But given the Wild West nature of web series, where buyers, monetization strategies and filmmaker goals are all in flux, was the format a useful one? Were the filmmakers on stage perfecting a performance they’d likely do somewhere down the line to actual buyers? Or was the panel’s aim more rhetorical, to enable a dialogue about how we should think and talk about web series? My opinion at 12:45PM — a little of both. Whereas a filmmaker pitching a script in Hollywood to industry buyers will be sharing with those buyers a set of assumptions — the film will be between 90 and 120 minutes, will have a certain budget, etc. — those pitching web series will be defining both the format as well as the content of their proposed series. That’s just one of five takeaways from today’s panel. 1. Define the format. “In this format, there’s no standard,” said judge Adam Goldman, creator of the web series Whatever this is, in response to a pitch by filmmaker Marty Shea. Shea’s series is A Billion to One, an ambitious, collaborative project in which episodes feature different people who want to change the world. The pitch started off by making it seem like a game show, said judge Ingrid Jungermann (writer/director, F to 7th), but Shea responded by describing it as “somewhere between a corporate drama and a Dickensian story.” All the more need to spell out precisely what the show is, all the way down to details like the number and length of the episodes, said Goldman. The panelists had similar comments to James Martin, whose web series Monica is about a loner high school girl who is suddenly revisited by her childhood imaginary friends — a purple monster, penguin, monkey, and rat — while in college. It wasn’t until his pitch was over and he was subjected to questions from the panel that he revealed his lifelong love of the work of Jim Henson and his participation in a puppet workshop. Those references immediately addressed production concerns as well as connected his own passions to the series. “We’ve hit upon a richer vein here,” said Goldman.